Dealing with Saddam Hussein through sanctions and other methods was a "very available" alternative to military action, a former UK diplomat has said. Carne Ross, who resigned over the war, told the Iraq inquiry that the UK did not work hard enough to make its pre-2003 policy of containment work. Officials trying to argue for this approach felt "very beleaguered". There was no "significant intelligence" to back up beliefs Iraq had weapons of mass destruction, he added. The Iraq inquiry is continuing to examine the background to the UK's participation in the 2003 invasion, the build-up to the war and its aftermath. Mr Ross was first secretary at the UK's mission to the UN between 1997 and 2002. In this role, he played an important role in liaising with UN weapons inspectors in Iraq and Security Council members as they sought to get Saddam Hussein to comply with his disarmament obligations. Mr Ross resigned from the Diplomatic Service in 2004 in protest over Iraq policy and told the Butler inquiry into the use of intelligence by the British government in 2004 that he believed serious policy mistakes had been made. He told the Chilcot inquiry on Monday that the policy of trying to contain Saddam Hussein by a combination of economic sanctions, diplomatic pressure and policing of no-fly zones in Iraq, was "under pressure" in 2001. Enforcement of sanctions was "politically difficult", because of concerns they were not adequately targeted and were being widely breached by the regime, but it was "doable", he said. However, UN officials received "very little senior support" from London and Washington in their efforts to make the sanctions regime more effective. During the period, Saddam Hussein's regime was being "sustained" by revenues from illegal oil exports through Turkey and Syria but the international community did little to clamp down on this. "That was an available option to us, as a government, that we never took," he said. Other methods of undermining the regime and preventing the momentum towards a military confrontation were neglected, he suggested. "It is astonishing to me that neither the US nor UK did anything about Saddam's illegal bank accounts which we knew to exist in Jordan. "That was not brain surgery to attack all those bank accounts. 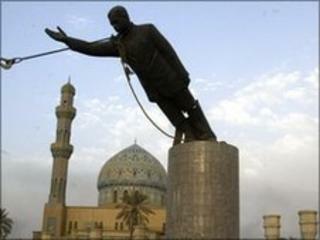 It was far less effort than any subsequent military effort was made to topple Saddam." Asked about the threat posed by Iraq, Mr Ross said there was no evidence that it was "substantially rearming" in the years before the invasion. "We continued to believe Iraq was certainly pursuing WMD programmes and there was a widespread belief that Iraq probably possessed some WMD of some kind. "But we had no significant intelligence, in the time I worked at the UK mission, of significant holdings of WMD." Criticising the September 2002 dossier on Iraq's weapons capability, he said the "uncertain and patchy" picture suggested by intelligence reports had been "converted" into the appearance of "positive" knowledge of a threat. "Whick I think is a process that is not justified," he said. He also criticised what he said was a document on Iraq's weapons capability circulated to Labour MPs in March 2002 - which suggested Saddam could develop a "crude" nuclear device within five years if arms programmes went unchecked. This was contrary to the government's position on the issue, he said, while the assertion was not corrected despite efforts by a senior foreign official to draw attention to it.